Create Synonym for the WAND Adapter creates the metadata used by reports to perform Sentiment Analysis scoring as well as sample reports which utilize the metadata. From the WebFOCUS Reporting Server Web Console or the Data Management Console, expand the Adapters folder, Configured folder, and then the WAND folder. Right-click the configured connection for the WAND Sentiment Analysis Adapter (for example, wand) and select Create Synonym from the context menu, as shown in the following image. The Select candidate(s) for WAND Synonym(s) (at wand) pane opens, as shown in the following image. Enter a specific application in the Application field or click the ellipsis button to the right of the field to select an application where the metadata is to be stored. The sample reports are stored within the wandsampl subdirectory of the application. 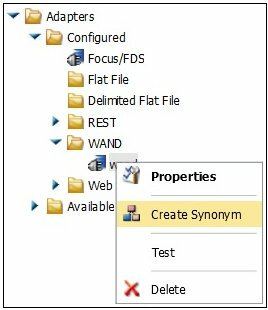 The Create Synonym for WAND Status pane opens and indicates that the synonym was created successfully, as shown in the following image.